Gamers lusting after some near Apple Retina display resolution on their gaming notebooks will finally have it thanks to the first-ever 3K laptop from MSI. MSI's newly announced GT60 2OD-261US boasts an anti-reflective 15.6-inch panel boasting a bountiful 2880 x 1620 resolution. In a market where gaming laptops usually come sporting 1080p screens, MSI says this is the "industry's first 3K gaming notebook." Compared to the Apple Retina display resolution of 2880 x 1800 pixels on a full-size 15-inch MacBook Pro, it's still lacking the same visual oomph. Luckily MSI's 3K gaming laptop more than makes up for its display with lap-searing parts. The notebook features a near top of the line Intel Core i7-4700MQ Haswell processor paired with a killer Nvidia GeForce GTX 780M GPU and 6GB of DDR3L-1600MHz memory. The high-end gaming system comes running Windows 8. The notebook's other bit include a 128GB SSD, 1TB HDD and Blu-ray reader. Gamers that want everyone to hear all the Battlefield 4 explosions can do so the Dynaudio Premium speakers, which come with a built-in subwoofer. Meanwhile, the Killer DoubleShot wireless tech will help reduce online game latency. 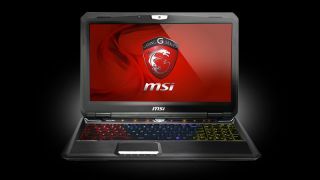 Alongside the GT60 2OD-261US announcement, MSI also launched the GT60 2OKWS-278US workstation notebook. The work-oriented laptop features the same 3K display and Intel Core i7-4700MQ processor. However, instead of a gaming graphics card, it comes with the Nvidia Quadro K3100M GPU meant for rendering video and graphics. Internally, everything is the same except for the disc drive being swapped for a Blu-ray burner and it comes running on Windows 7 Professional. Both notebooks also come with a built-in 720p video cam and various ports including three USB 3.0 ports and two USB 2.0 ports, HDMI, and two mini Display Ports. The new laptops won't come cheap, so be prepared to pay $2,199 (about £1,347/AU$2,420) for the GT60 gaming laptop and $2,799 (about £1,715/AU$3,080) for the workstation. MSI has yet to announce the availability of either laptops, but we've contacted the notebook maker and will update as soon as we know.